Labour union, National Health Education & Allied Workers Union (Nehawu) has vowed to intensify its strike action this week at TVET colleges across the country. It says this is because a solution hasn’t been found in the impasse with the Higher Education Department. Lecturers affiliated to Nehawu embarked on a nation wide strike over a week ago. TVET colleges country wide remain paralysed as a result. Workers are demanding permanent employment, pay hikes and benefits. They are also calling for the re-alignment of the TVET sector organogram. Students have been unable to access campuses amid the prolonged strike. This as meetings between Nehawu and the Higher Education Department are yet to yield results. Nehawu says another meeting with the department is on the cards. But if their demands are not met again, lecturers will not return to class. “We still remain vehemently opposed to discussing or to discuss the issues in the presence of the director general because we continue to hold a strong view that he is at the centre of the problem that is engulfing both the TVET and CET sector. We have no hope that he can be of any assistance,” says Nehawu General Secretary, Zola Saphetha. 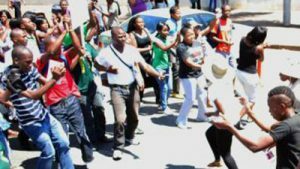 Meanwhile, first year students from thirteen TVET Colleges in Nelson Mandela Bay have pleaded with the Department of Higher Education’s senior managers and Nehawu to find an amicable solution to end the strike which is affecting their studies. Nehawu members have been picketing at all campuses for the past two weeks, joining the nationwide strike. Their demands include full time employment for contract workers and the re-aligning of the TVET sector. The post Nehawu vows to intensify TVET colleges strike appeared first on SABC News – Breaking news, special reports, world, business, sport coverage of all South African current events. Africa's news leader..